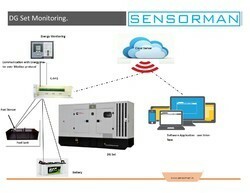 DG set monitoring system used to monitor fuel comsumption , alterneter health monitor, energy manegment and reporting . Thsi device comes with Built in WiFi system. DG set monitoring device has provision for RS485 modbus , user can connect DG set controller and/or energy meter . If DG set don't have it's won controller , user can connect level sensor, pressure sensor, engine RPM sensor, Tempareture sensor, door sensor. All data from sensors, controller and energy meter send to server in real time. Monthly, weekly , daily report generats for fuel consumption, energy consumption, running hour, overlap hour etc.